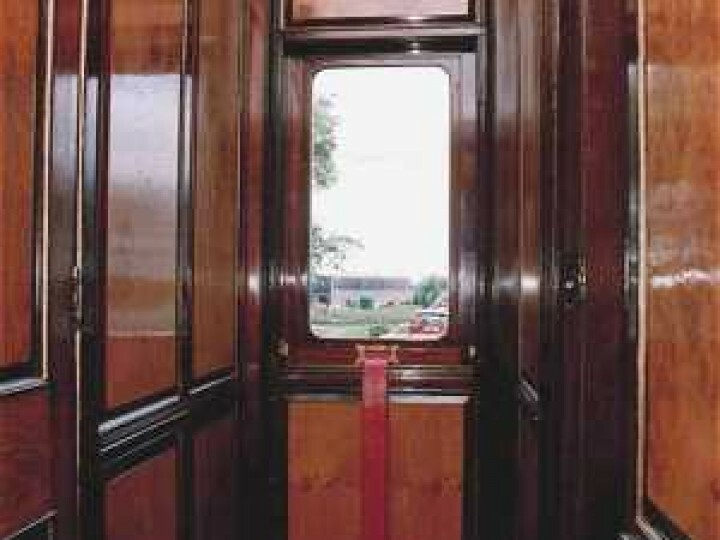 The GS&WR saloon was built at Inchicore during 1902/3. It replaced an earlier six-wheel state coach built in 1851 and used by Queen Victoria in 1861. Comprised within a coach body of only 28 feet long, that coach had three compartments, described as the Anteroom, the Salon and the Boudoir. This vehicle was no longer considered fit for use at the time of the impending State Visit of King Edward VII to Ireland in 1903. 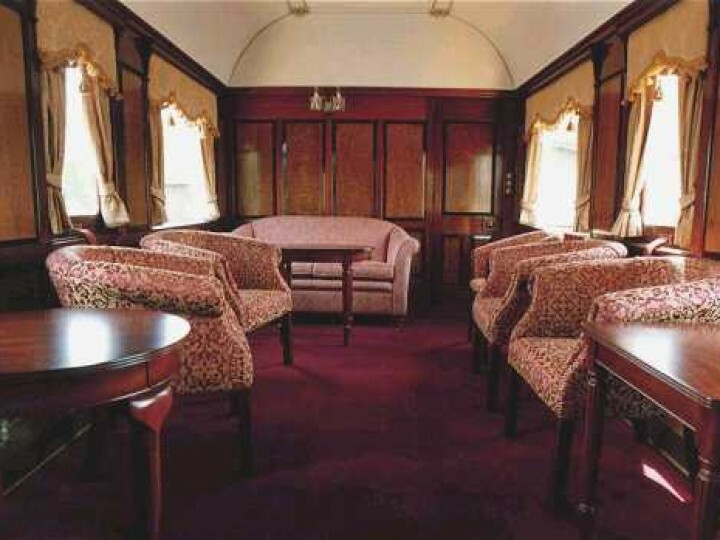 The new coach was 50 feet long, carried on two, two axle bogies, and it too is divided into three saloons, referred to then as the Reception Saloon, the Smoking Room (for the King's use) and the Queen's Boudoir. 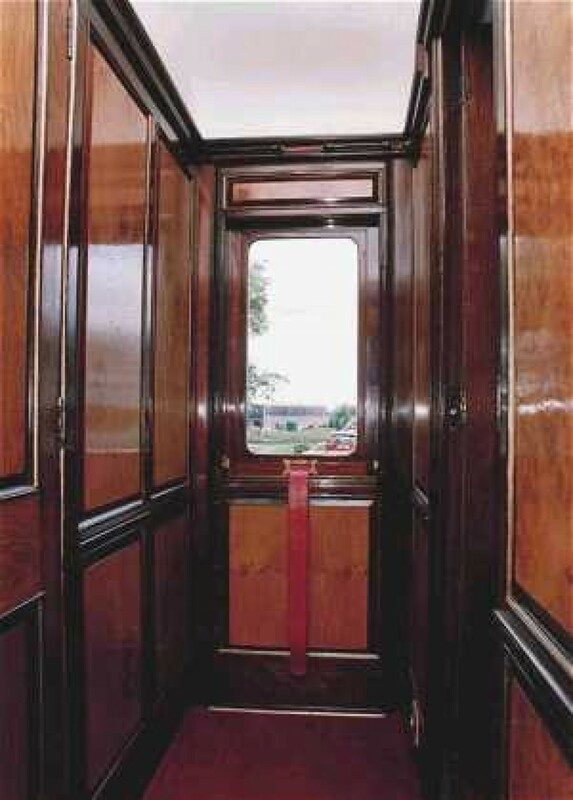 The principal entrance to the coach was by a central vestibule situated between the Smoking room and the Reception saloon. A WC and wash basin were located at the other end of the vehicle, entered from a second vestibule and which was presumably regarded as an "en-suite" with the Queen's boudoir. - Width over door handles 9'3"
- Height over roof 12'7"
- Seating 18 passengers on armchairs and settees. 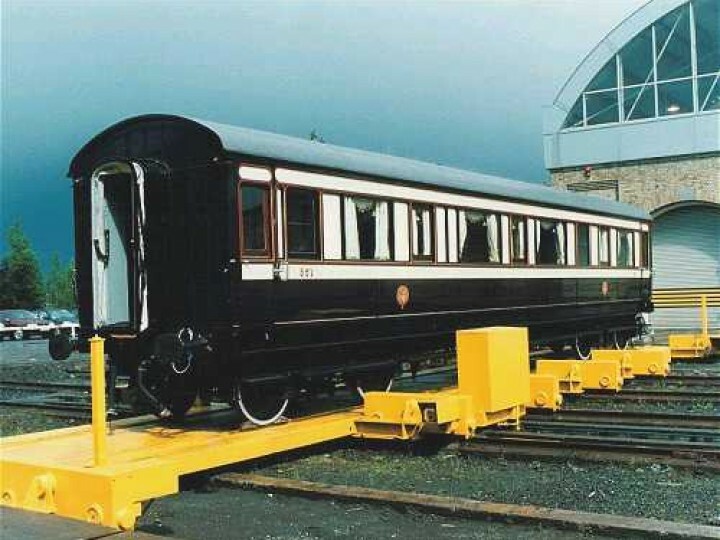 As built 351 had a rather low profiled clerestory roof and was unusual in having a gangway connection at one end only, from the same vestibule that served the Queen's WC. 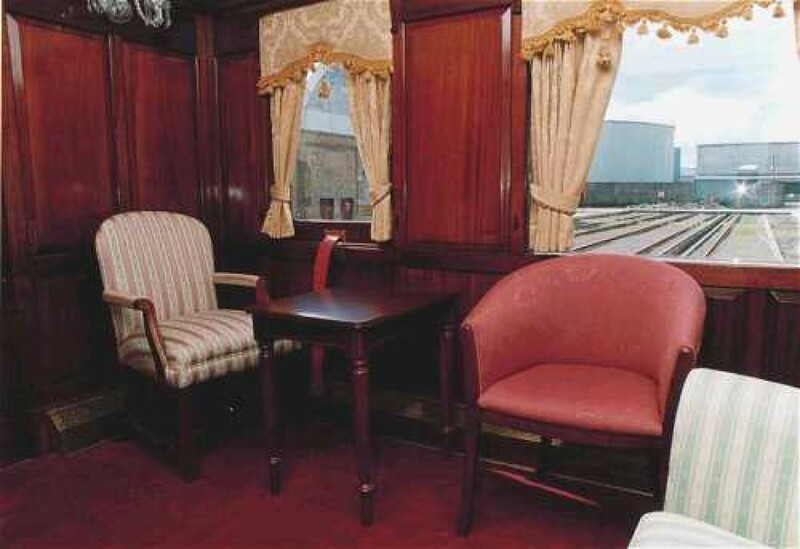 The other end of the coach was occupied by the King's WC which was widthways across the coach, and had end windows to enable His Majesty to observe the view down the track - or more likely the swaying end of the next coach! 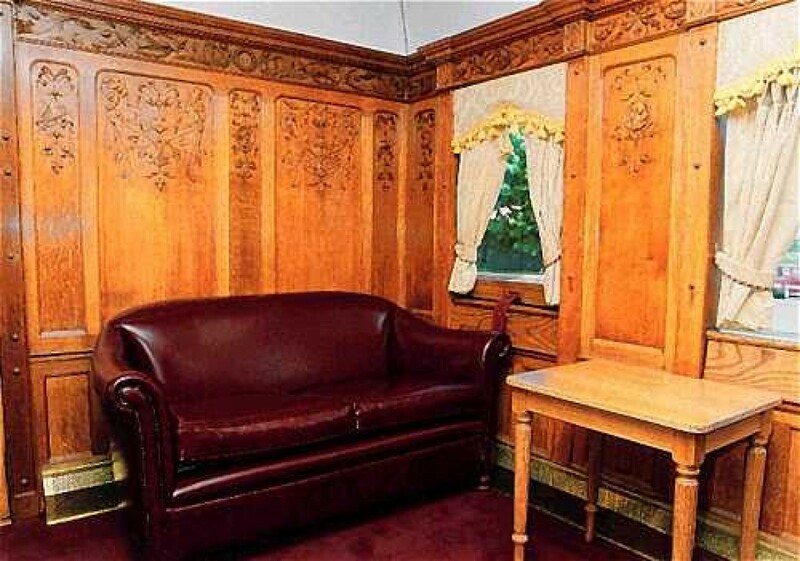 The decoration of the coach was carried out by Sibthorpes of Molesworth Street, Dublin, and records indicate that the main saloon was done in the then fashionable "Art Noveau" style with "Francis 1" for the Smoking Room, and "Louis Quinze" for the Queen's Boudoir. It was carried out under the supervision of Lady Goulding, wife of Sir William Joshua Goulding Bart., the then Chairman of the GS&WR. There were few further occasions suitable for the coach, and it lay in storage in Inchicore for most of the time until Ireland's independence in 1921. 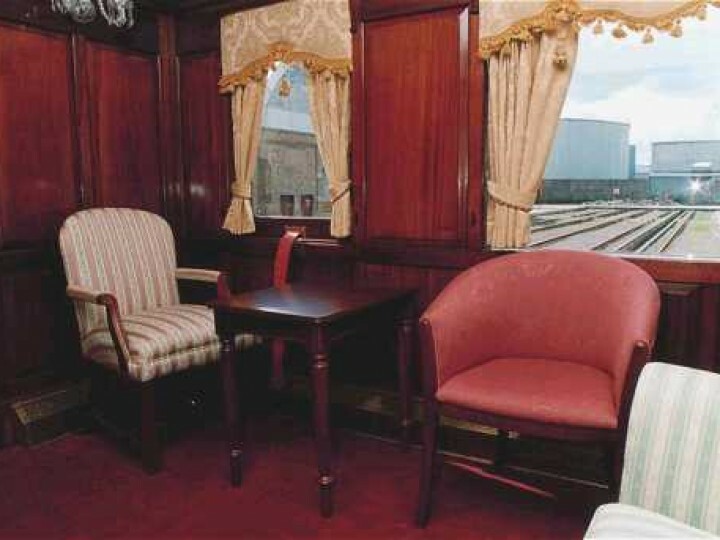 The next recorded 'public' use of the coach was by Taoiseach W.T. Cosgrave in October 1923 when he opened the re-built viaduct over the River Blackwater at Mallow. The coach did little public work until 1961 when it was extensively refurbished for a visit by the Papal Legate, Cardinal Agagianian, on 20th June that year, when he made a return between Dublin and Cork. 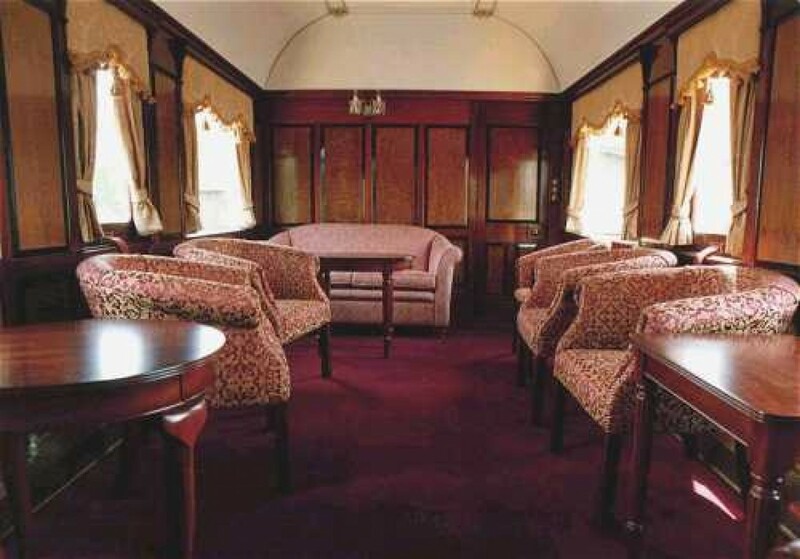 The coach was refurbished with Commonwealth bogies, the three saloons were now referred to as compartments, Oak, Mahogany and Walnut, each recieving a major makeover including the use of Irish materials and motifs. After the Papal Legate's visit the coach was exhibited at many CIÉ stations to great acclaim. At this time it became known officially as the Presidential, or State, Saloon. In this guise it was used during the 1960s and early 1970s to carry such figures as the Emperor Haile Selassie of Ethiopia and Dr Kenneth Kaunda of Zambia as well as Irish Presidents and visiting dignitaries. The CIÉ coaching stock register dated 1st February 1961 records 351 as a "Bogie First" carriage, two gangways seating 26 first class passengers. The coach was stored in the carriage shed in Cork for many years, moving later to Inchicore when the space was needed in Cork. It was stored in the open for several years until a decision was made to move it indoors for drying out. Unfortunately, a major fire in the Carriage Shed in September 1991 nearly destroyed the vehicle. Quick work by the Inchicore fire crew, who dragged 351 outside just in time, saved the coach from total destruction. 351 was retained officially in traffic until 1972, when it was withdrawn and replaced by a newly built Presidential Saloon based on a standard BREL Mk2 body shell. The coach remained outdoors in the roofless carriage shed. In 1991 the Managing Director of Irish Rail took the decision to put the coach under cover, dry it out, and see if it could be restored. In 1995 the RPSI was successful in arranging with Irish Rail to borrow the vehicle on long term loan, and the Society commenced restoration helped by FAS the Employment and Training Authority and a number of sponsors. in Dublin to carry out the work, under the supervision of a skilled craftsman who had worked on the vehicle when in railway company use. The work was completed in early 2000 in Inchicore works with the coach being certified to mainline standard. The first trip undertaken by the coach was on 12th September when the coach was hauled on a test train to Sallins by No.461. Also in this trial was 1930s compartment 1335, and 1921 all first 1142, which has been finished in a livery matching 351. The coach was launched officially by the President of Ireland, Mary Mc Aleese on 18th October 200 with a run from Dublin's Pearse station to Dun Laoghaire. A group of dignitaries which included Dr John Lynch, the chairman of CIÉ accompanied the president. The train was hauled by No.461 flying the presidential standard, and as well as 351 consisted of GS&WR all first 1142, CIÉ open second 1463 and CIÉ brake/generator second 1916. The Awards in the Heritage Railway Association's bi-annual Carriage and Wagon Competitions were presented at a dinner held by the Association at the National Railway Museum in York on Saturday 9th June to celebrate 50 years of railway preservation. Overall winner is Irish State Coach 351 which was entered by the Railway Preservation Society of Ireland (RPSI). They will hold the "Railway Magazine Lamp" for the next two years. In addition they receive a commemorative plate in the style of a carriage builder's plate. This plate was produced by Swindon Historic Castings, a joint venture between HRA and the local authority. The judges commented: "This vehicle is in a class of its own. 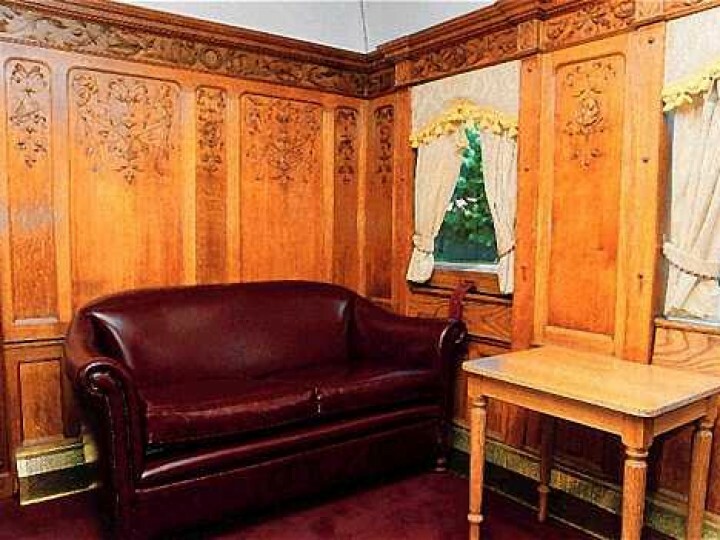 It was built for Edward VII as an opulent clerestory roofed, single gangwayed saloon. In due course it became the Irish State Coach. After withdrawal in 1970 it survived a fire in Inchicore works, suffered from various forms of rot, and has now been restored by RPSI. The restoration features appropriate furnishings, panelling in the style of Francis I, light fittings in Waterford crystal and wash basins in Connemara marble."